Mushroom powder is as simple as it sounds; it’s nothing more than dried mushrooms ground into an ultra-fine powder that’s usually almost tasteless. Most of these mushroom varieties are used medicinally around the world, but they lend themselves well to use in everything from soups and smoothies to coffee. Is mushroom powder less healthy than eating your fungi fresh? The drying process doesn’t compromise the potency or bioavailability of the mushroom’s nutrients. In fact, it increases their concentration so you get a better benefit. As an example, fresh mushrooms have 4 IUs of vitamin D per serving, while dried can top 26 IUs. Reishi: Purely used as a medicinal mushroom, reishi can be used to make tea or incorporated into numerous dishes, though you might want to cover the slightly bitter flavor. The mushroom is known to improve immune system functioning and promote anti-inflammatory effects that can potentially slow down tumor growth. Learn more about reishi mushroom benefits here! Chaga: Grown across the world, chaga mushrooms purportedly help reduce inflammation, enhance liver health, boost the immune system and slow down tumor growth. 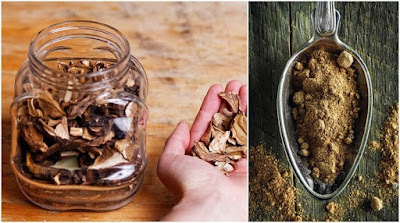 Miatake: Known colloquially as “hen of the woods” this tasty Japanese variety has anticancer and antiviral effects, and it can also help control blood pressure and blood sugar levels. Lion’s Mane: This medicinal and culinary mushroom is believed to stimulate nerve growth and might also improve mild cognitive impairment. This makes it a smart mushroom powder to take before you need to take a test or give a presentation that requires focus. Cordyceps: This Chinese mushroom is believed to improve athletic performance, and treat general weakness, making it a popular supplement for athletes. Shiitake: Their meaty flavor makes them popular for use in recipes, but shiitake mushrooms also work well as a mushroom powder. They have antiviral and anticancer effects that make them smart to add to your diet. For the freshest powder, it’s also possible to grow your own shiitakes and dehydrate them after. Turkey Tail: This medicinal mushroom has anticancer effects without a strong taste. If you can’t commit to just one type of mushroom, a better option is to use a mushroom powder blend such as this Four Sigmatic 10 Mushroom Blend that combines numerous varieties. This lets you maximize their health benefits. It’s also possible to buy formulated mushroom powder drinks like mushroom coffee. While every mushroom variety offers different health benefits, there are some benefits that almost every type can provide. Those include the following. A significant reason why many people consider consuming mushroom powder is that many varieties can boost your immune system. The details aren’t yet clear, but certain mushroom varieties seem capable of improving the functioning of white blood cells and alter inflammation pathways to make them more effective against potential pathogens. Mushroom powder is good for your cholesterol levels, as preliminary research shows that it can increase the amount of “good” HDL cholesterol in your system. This can put you at less risk for heart disease and potentially even heart attacks. If you struggle to lower your blood sugar levels, then mushroom powder might be what you need. Studies show that the molecules within many types of mushrooms (especially reishi) can decrease blood sugar levels, at least in animals. There is also evidence that mushroom powder before eating a meal can prevent your blood sugar levels from spiking afterward. Forget blueberries and spinach; mushroom powder might be the new way for you to keep your antioxidant levels high. These molecules help prevent damage from occurring to your cells, and many reports show that medicinal mushrooms are high in antioxidants and they can enhance the body’s antioxidant status as well. This review of recent developments in the study of mushrooms and their anti-cancer properties identified that shiitake mushrooms have been found to suppress leukaemia cell proliferation, the turkey tail mushroom possesses anti-tumor properties against many types of cancers and the reishi mushroom has been found to have anti-cancer effects whether used alone or in conjunction with chemotherapy and radiotherapy. While you shouldn’t consider mushrooms a cure-all for fighting cancer, it stands to reason that incorporating mushroom powder into your daily routine can have a positive impact at preventing or managing a cancer diagnosis. Many medicinal mushroom varieties are renowned for their ability to boost energy levels and reduce both physical and mental fatigue. One study that looked specifically at people suffering from general exhaustion found that their symptoms improved dramatically after eight weeks of taking mushroom powder supplements. Similar results were found for powdered mushroom’s ability to improve the energy levels and quality of life for breast cancer survivors. So you’ve been convinced to try mushroom powder. How should you put it to use? There’s an almost unlimited number of ways you can incorporate this versatile powder into your meals, but these suggestions will get you started. Add to sautéed veggies to make even mushroom haters mega fans. When you cook with mushroom powder, be sure to add it to your recipe at the end of the cooking cycle. This keeps the flavors more intense and reduces the chance that you accidentally cook out the nutritional value. For those feeling extra adventurous, it’s easy to make your own mushroom powder. You’ll save plenty of money from making it yourself, and it’s a great way to use up extras if you cultivate too many. The steps couldn’t be more straightforward to follow. Source a safe supply of fresh mushrooms and wash them thoroughly before using. Slice the mushrooms into thin slices. A mandolin slicer works best for even cuts. Arrange the slices on the drying rack of a food dehydrator, ensuring that they aren’t touching so that there’s good air circulation. Alternatively, you can also use your oven. Set the dehydrator (or oven) to about 130 degrees, and let the mushrooms dry out from between 8-14 hours, or until they’re crispy to the touch. If you sense any sponginess, keep the dehydrator on longer. Add the dehydrated mushrooms to your food processor and pulse them into a fine powder. You might want to start slowly with a few mushrooms at a time so that you aren’t left with large pieces. Allow the resulting powder to settle before opening the food processor, so you don’t inadvertently inhale a mouthful. Store the powder in airtight containers and out of direct sunlight, and it should easily keep for several months.